Received January 4, 2019; Revised February 17, 2019; Accepted February 25, 2019. The purpose of this study was to assess the intra-rater and inter-rater reliability and validity of pelvic tilting angle measurements using a smart phone-based inclinometer (Clino) compared to a palpation meter (PALM) in the standing and sitting position. This study used an interchangeable method with Clino to measure the pelvic tilting angle in the standing and sitting positions. Twenty healthy subjects were recruited. Measurements of the pelvic tilting angle in the standing and sitting positions were obtained by two examiners using the Clino and PALM. A resting session was conducted 10 minutes later to assess the intra and inter rater reliability. To assess validity of the measurement using Clino, a PALM was used as the gold standard. The intra-class correlation coefficient (ICC) was used to determine the intra and inter rater reliability of Clino and a PALM. To assess the validity, the Pearson correlation coefficients were used for two measurement techniques to measure the pelvic tilting angle in the standing and sitting positions. The statistical significance was set to α=0.05. Measurements of the pelvic tilt had high inter-rater reliability in the standing (ICC=0.82) and sitting (ICC=0.88) positions using Clino and intra-rater reliability in the standing (ICC=0.87) and sitting (ICC=0.91) positions using Clino. Measurements of the pelvic tilt had high validity by a comparison of PALM and Clino in the standing (r=0.83) and sitting (r=0.89) positions (p<0.05). The use of Clino can be recommended as a tool to replace the PALM and measure the pelvic tilt angle in the standing and sitting positions while maintaining the clinical reliability and validity. 과도한 골반기울임 각도는 척추 앞굽음이 비정상적으로 증가된 상태를 의미하며, 각도가 경미할 경우 척추 앞굽음이 감소된 상태를 말한다. 따라서 이 같은 구조를 파악하기 위해 골반기울임 각도의 정확한 평가는 치료에 앞서 임상적으로 상당히 중요하다고 할 수 있다. 골반이 앞으로 기울어진 상태인 골반 앞기울임은 넙다리네갈래근과 엉덩허리근, 넙다리근막긴장근, 엉덩관절 주머니, 엉덩관절의 앞쪽 인대와 근막 구조의 단축과 이로 인해 생겨난 제한된 엉덩 관절 폄에 의해 발생한다. 증가된 골반 앞기울임과 척주앞굽음증은 달리기 중 근 골격 손상의 위험이 증가한다는 보고가 있으며,5 배근육이나 큰볼기근을 잘 사용하지 못하게 되어 발달을 어렵게 만들며 각종 통증을 불러 올 수 있다. 여러 연구에서 골반 비대칭의 신뢰성 및 정량화 문제를 해결하기 위해 다양한 도구를 조사하였지만, 스마트폰 기반의 경사계 어플리케이션인 Clino를 PALM과 비교하여 앉은 자세와 선 자세에서의 골반 기울임 각도를 측정한 연구는 없었다. 따라서 본 연구가설은 골반의 위치를 평가하기 위해 서 있거나 앉은 자세에서의 골반 기울임 각도를 Clino와 PALM으로 측정하여 PALM을 대신하여 스마트폰 애플리케이션인 Clino를 사용 할 수 있을 것이다. 또한, 대체방법의 신뢰도와 타당도가 기존방법에 비하여 통계학적으로 유의한 차이가 없을 것이라는 가설을 증명하려 한다. 건강한 20대 여성참가자 20명이 본 연구를 위하여 자발적으로 참여하였다. 본 연구의 실험 프로토콜은 호서대학교 연구윤리위원회의 심의를 거처 승인되었으며, 참여한 대상자들은 실험 전 모두 자발적 참여 동의서에 서명하였다. 연구대상자의 선정기준은 척추의 올바른 정렬을 가진 자 즉, 봉우리, 엉덩뼈 능선의 가장 윗부분, 엉덩관절의 큰돌기, 종아리뼈머리 그리고 가쪽 복사뼈가 수직선 위에 위치한 자이다.16 허리 원반탈출증 수술을 받은 지 6개월 이내의 대상자는 제외하였다. 실험에 참가한 대상자들의 특성은 다음과 같다(Table 1). 바로 선 자세와 앉은 자세에서 위앞엉덩뼈가시와 위뒤엉덩뼈가시를 찾아 PALM을 사용하여 골반의 기울기를 측정하였다. 동일한 스마트폰 기종에 설치한 어플리케이션 Clino (모델명: Clinometer+bubble level, 개발자: plaincord) 또한 PALM (PAA 12-1180, PALpation Meter, baseline, USA)과 같은 방법으로 바로 선 자세와 앉은 자세에서 위앞엉덩뼈가시와 위뒤엉덩뼈가시를 찾아 그 사이를 테이프로 붙이고 골반의 기울기를 측정하였다(Figure 1). 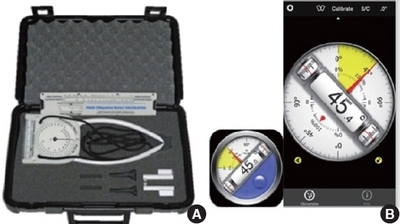 (A) Palpation meter (PALM), (B) Clinometer (Clino). PALM과 Clino로 골반 기울임 각도를 측정하기 위해 바로 선 자세 시 다리는 어깨너비로 벌리고 팔을 X자로 모아 가슴 위에 위치시켰다. 앉은 자세 시 큰 돌기(greater trochanter)와 종아리뼈 머리(fibular head)를 이은 선이 지면과 수평을 이루게 하고 팔을 X자로 모아 가슴 위에 위치시켰다(Figure 2). 이때 각 실험도구의 오차를 줄이기 위해 레깅스를 입고 측정하였다. PALM을 사용하여 골반의 기울기를 측정하기 위해 위앞엉덩뼈가시와 위뒤엉덩뼈가시를 촉진한 후 서 있을 때와 앉아있을 때의 골반기울임 각도를 측정하였다. 위앞엉덩뼈가시와 위뒤엉덩뼈가시를 촉진 시에는 양손가락을 밑에서부터 퍼올리듯이(scoop) 하여 측정 지점을 정하였다. Clino 또한 PALM의 측정법과 같이 서 있을 때와 앉아 있을 때의 위앞엉덩뼈가시와 위뒤엉덩뼈가시를 촉진하고 그사이 연결선을 테이프로 표시한 후 경사도를 측정하였다(Figure 3). 본 실험에는 검사자 두 명과 기록자 한 명으로 이루어졌다. 검사자1이 각각 두 번씩 측정하고 검사자2가 각각 한 번씩 측정하여 검사자 내 신뢰도와 검사자 간 신뢰도를 알아보았다. 검사자 내 신뢰도를 위하여, 검사자1의 측정이 끝나면 부착했던 테이프를 제거하고 10분 뒤 검사자1이 다시 측정을 하였다. 검사자 간 신뢰도를 위하여, 검사자1이 마지막 측정을 마치면 부착했던 테이프를 제거하고 10분 뒤 검사자2가 다시 부착하여 실험을 진행하였다. 한 명의 실험대상자를 측정할 때, PALM과 Clino의 측정순서는 무작위 순서로 진행하였다. 모든 측정값은 기록자만이 PALM과 Clino에서 나타내고 있는 수치를 보고 기록하는 블라인드 실험을 진행하였다. 휴식시간은 측정 후 10분이 주어졌다. (A) standing position, (B) stitting position. marking the pelvis with the tape. 본 실험의 실험결과는 SPSS (IBM statistic ver. 20)를 이용하여 통계처리하고, 평균± 표준편차로 기술하였다. One-sample Kolmogorov-Smirnov test를 통해 측정의 정규분포를 확인하였다. 본 연구에서는 신뢰도 평가방법으로 급내상관계수(ICC 3, 1)를 사용하였다. 급내상관계수 값의 범위는 0에서 +1 사이에 있다. 1이면 완전 일치를 뜻하며 ICC 값이 0.81-1.0 사이일 경우 “very good”, 0.61-0.80 사이일 경우 “good”, 0.41-0.60 사이일 경우 “moderate”, 0.21-0.40 사이일 경우 “fair”, 그리고 0.20 이하이면 “poor” 신뢰도를 의미한다.17 타당도 평가방법은 피어슨 상관계수를 사용하였다. 통계학적 유의수준은 0.05로 정하였다. 모든 통계학적 분석은 SPSS Statistics software 23 (IBM Corp., Armonk, NY, USA)을 사용하였다. 서 있는 자세에서 PALM과 Clino의 타당도는 ICC (3.1)= 0.83이었고 앉은 자세에서 타당도는 r= 0.89이었다 (p< 0.05)(Table 2). 골반의 앞기울임, 뒷기울임의 정렬은 자세 안정성, 균형, 보행에 영향을 미치며, 허리뼈 정렬에 직접적으로 영향을 줄 수 있다. 또한 일반적으로 엉치허리와 다리 기능장애, 허리통증이 있는 환자를 평가할 때 골반 위치의 평가가 수행된다. 이 연구의 실험 결과는 다음과 같이 나왔다. 앉은 자세에서 PALM의 검사자 내/검사자 간 신뢰도는 ICC값 0.92/0.87이었고, 서있는 자세에서 PALM 검사자 내/검사자 간 신뢰도는 ICC값 0.89/0.85로 서 있을때 보다 앉은 자세에서 측정한 것이 근소한 차이로 더 높은 신뢰도가 나왔다. Clino에서의 앉은 자세 시 검사자 내/검사자 간 신뢰도는 ICC값 0.91/0.88이고, 서있는 자세 시 Clino 검사자 내/검사자 간 신뢰도는 ICC값 0.87/0.82로 Clino 또한 앉은 자세에서 측정한 것이 더 높은 신뢰도가 나왔다. 타당도 역시도 앉은 자세 값 0.89로 서있는 자세 값 0.83보다 더 높은 타당도가 나왔다. 과도한 골반기울임 각도는 척추 앞굽음이 비정상적으로 증가된 상태를 의미하며, 각도가 경미할 경우 척추 앞굽음이 감소된 상태를 말한다. 따라서 이 같은 구조를 파악하기 위해 골반기울임각도의 정확한 평가는 치료에 앞서 임상적으로 상당히 중요하다고 할 수 있다. 골반 기울임을 측정하는데 있어 PALM은 가장 타당하고 신뢰할 수 있는 도구이다.12 하지만 PALM은 비용적으로 비교적 고가이고, 일반적으로 사용하기에는 어려움이 있다. 그래서 골반기울임을 측정할 때 PALM을 대신해 어플리케이션을 사용할 수 있는지 증명하고자 하였다. PALM을 이용한 선행연구를 살펴보면, 선 자세에서 골반의 비대칭성을 검사했을 때 0.84 (이마면)과 0.98 (시상면)의 검사자 내 신뢰도 그리고 0.65 (이마면)과 0.89 (시상면)의 검사자 간 신뢰도를 확인할 수 있었다.14 선행 연구에서는 시상면에서 골반의 비대칭성을 검사하게 위해 양쪽의 위앞엉덩뼈가시와 위뒤엉덩뼈가시를 촉진하여 평가하였고, 이마면에는 엉덩뼈 능선의 가장 윗부분을 촉진하여 골반 비대칭성을 평가하였다. 선행연구에서의 결과를 보면, 시상면에서의 골반기울임 각도는 8.35-11.3도 사이를 정상으로 판단하는데, 검사자 내/검사자 간 신뢰도는 0.98/0.89를 나타냈다. 본 연구에서도 PALM을 이용한 결과값을 보면 시상면에서의 골반 기울임 각도가 평균 8.95-9.60도 사이를 기록했고, 신뢰도 역시 임상적으로 신뢰할 수 있는 수준으로 보여졌다. Clino를 이용한 측정에서도 높은 신뢰도 및 타당도를 보였기 때문에 임상적으로 PALM을 대체하여 Clino를 사용하는 것이 추천될 수 있다고 생각한다. 이 연구에서는 제한점이 있다. 첫째, 젊고, 건강한 여성 대상자만 선정하여 연구를 진행하였다. 고령의 환자나 디스크환자 또는 뇌성마비, 척추옆굽음증 등 척추 정렬이 바르지 못한 자들이나 다른 성별의 대상자에게는 이 연구방법이 다른 결과가 나올 수 있다. 추후 연구에서는 다양한 연구대상자 그룹과 자세에 있어서도 서있는 자세와 앉은 자세뿐만 아니라 앞으로 구부린 자세, 한쪽으로 치우친 자세 등 여러 자세로 변형한 상태에서 골반 기울임 각도 측정법 신뢰도와 타당도 연구가 필요하다. Clino를 사용하여 골반의 기울기를 측정할 때 테이프를 이용하여 경사를 만들고 어플리케이션을 이용하여 각도를 재야하지만 테이프를 붙일 때 골반의 능선으로 인해 선이 일직선이 되지 않고 위 아래로 휘는 경우가 발생할 수 있다. 따라서 청바지 같은 두꺼운 소재의 옷 보다는 몸에 달라붙는 레깅스와 같은 의류 입고 Clino를 사용하여야 신뢰할 수 있는 측정 값이 나올 것이다. 본 연구는 한국연구재단 기초과학연구 (생애첫연구)의 연구비 지원을 받았음 (No. 2017R1C1B5076172). Gu JS, Choi SJ, Choi HS et al. Effects of pelvic tilt training using inclinometer on joint position sense and postural alignment in patients with chronic stroke. J Kor Phys Ther 2016;28(1):33-8. DeSilva JM, Rosenberg KR. Anatomy, development, and function of the human pelvis. Anat Rec 2017;300(4):628-32. Endo K, Suzuki H, Nishimura H et al. 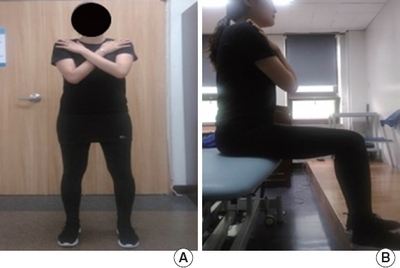 Sagittal lumbar and pelvic alignment in the standing and sitting positions. J Orthop Sci 2012;17(6):682-6. Chaléat-Valayer E, Mac-Thiong JM, Paquet J et al. Sagittal spino-pelvic alignment in chronic low back pain. Eur Spine J 2011;20(5):634-40. Schache AG, Blanch PD, Murphy AT. Relation of anterior pelvic tilt during running to clinical and kinematic measures of hip extension. Br J Sports Med 2000;34(4):279-83. Park SH, Yuk GC, Ahn SH et al. Lumbar Spine Kinematics during anterior and posterior pelvic tilting in supine and prone positions. J Kor Phys Ther 2011;23(6):9-14. Schache AG, Blanch P, Rath D et al. Three-dimensional angular kinematics of the lumbar spine and pelvis during running. Hum Mov Sci 2002;21(2):273-93. Sullivan MK, Dejulia JJ, Worrell TT. Effect of pelvic position and stretching method on hamstring muscle flexibility. Med Sci Sports Exerc 1992;24(12):1383-9. Beardsley C, Egerton T, Skinner B. Test–re-test reliability and inter-rater reliability of a digital pelvic inclinometer in young, healthy males and females. Peer J 2016;4:1881. Gajdosik R, Simpson R, Smith R et al. Pelvic tilt:Intratester reliability of measuring the standing position and range of motion. Phys Ther 1985;65(2):169-74. Herrington L. Assessment of the degree of pelvic tilt within a normal asymptomatic population. Man Ther 2011;16(6):646-8. Kim JH, Chang SK. The Effects of Robo-horseback riding with changes of pelvic tilting and speeds on muscle activities of trunk and lower limb. J Kor Phys Ther 2014;26(5):290-5. Petrone MR, Guinn J, Reddin A et al. The accuracy of the palpation meter (PALM) for measuring pelvic crest height difference and leg length discrepancy. J Orthop Sports Phys Ther 2003;33(6):319-25. Hagins M, Brown M, Cook C et al. Intratester and intertester reliability of the palpation meter (PALM) in measuring pelvic position. J Manual Manip Ther 1998;6(3):130-6. Hayes AM, Place HM, Hayden A et al. The use of the PALM palpation meter for measuring pelvic tilt and its correlation with radiographic measures. The Spine Journal 2016;16(10):S355-6. Sahrmann SA. Diagnosis and treatment of movement impairment syndromes. St Louis, Mosby, 2002. Yoon TL. Validity and reliability of an inertial measurement unit-based 3D angular measurement of shoulder joint motion. J Kor Phys Ther 2017;29(3):145-51. Kinsella SM, Harvey NL. A comparison of the pelvic angle applied using lateral table tilt or a pelvic wedge at elective caesarean section. Anaesthesia 2012;67(12):1327-31. Panjabi MM. The stabilizing system of the spine. Part II. Neutral zone and instability hypothesis. J Spinal Disord 1992;5(4):390-6. Haeri Seyed MJ, Razeghi M, Taghizadeh IS et al. Designing a new method for measuring lumbar lordosis. Qom university of medical sciences journal 2015;9(9):35-41. Bonifácio D, Lopes Í, Martins F et al. Intra-and inter-rater reliability in photogrammetric pelvic tilt angles analysis. IJTR 2013;20(2):86-90. Kim SJ, Jeong SY, Yoon TL. The effect of visual feedback of head angles with using a mobile posture-aware system on craniocervical angle and neck and shoulder muscles fatigue during watching the smartphone. J Kor Phys Ther 2018;30(2):47-53.